while my parents were visiting over the weekend, ryan and i made cucumber dill chicken salad for lunch. 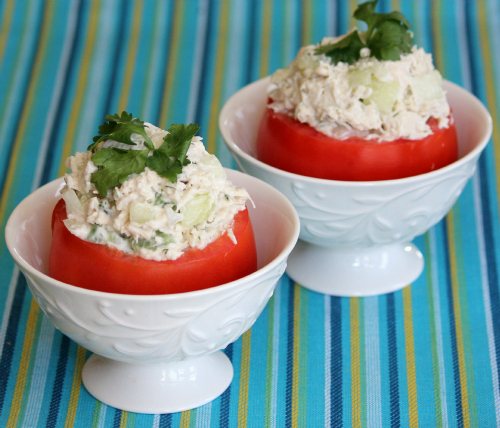 in order to save a few calories, we served the chicken salad in tomato cups instead of on bread. 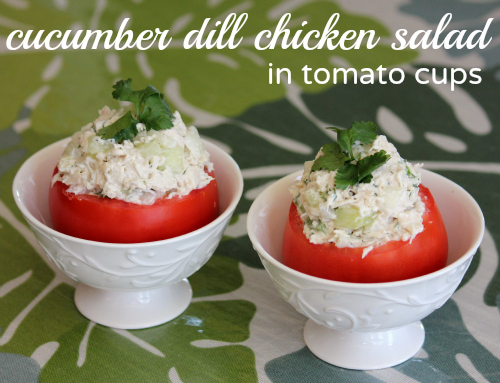 the fresh dill adds such a nice flavor to this chicken salad, and the tomato cups act as perfect little edible bowls. dice the chicken, cucumber, onion, and celery into small pieces. in a large bowl combine all of the ingredients and mix well. cut the tops off the tomatoes, and hallow out each tomato using a spoon or an ice cream scoop. fill the tomatoes with the chicken salad mixture, and garnish with fresh cilantro. Oh goodness! This looks so yummy! !